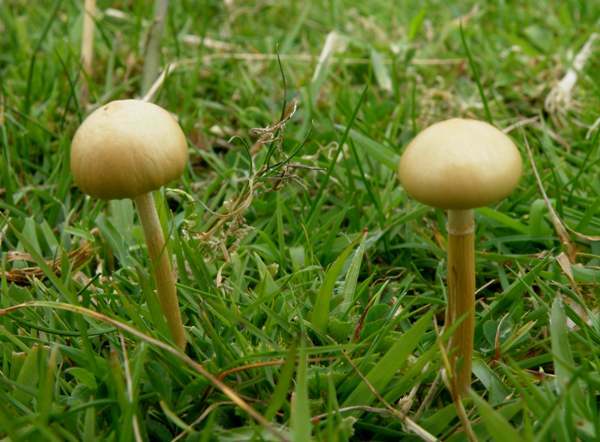 Commonly known as the Dung Roundhead, because of its cap shape and habitat preference, Protostropharia semiglobata is frequently seen on commons, grazed heaths and on pasture land throughout summer and autumn. Caps of this coprophilous mushroom are very variable in size, and sometimes the caps turn a lot browner than those shown here; this can make identification more difficult - at least until you have seen plenty of Dung Roundheads. Protostropharia semiglobata is widespread and common throughout Britain and Ireland as well as in all countries on mainland Europe. This species occurs in many other parts of the world including North America and (by introduction) Australia. After being moved through several other genera, the Dung Roundhead was finally settled into its present taxonomic position in 1872 with the help of the French mycologist Lucien Quélet. It seems that nothing in mycology is ever truly settled, however, and early in 2013 American mycologist Scott Redhead and colleagues proposed a new genus, Protostropharia, to contain those Stropharia species in which astrocystidia rather than crystalline acanthocytes form on their mycelia; Redhead has made Protostropharia semiglobata the type species of this proposed genus. Kew and the British Mycological Society in their check lists of fungi have now adopted the Protostropharia separation, and so Stropharia semiglobata (Batsch) Quél. is a deprecated scientific name of this species in Britain. Above: at this stage in their development Dung Roundheads truly deserve their common name. Synonyms of Protostropharia semiglobata include Agaricus semiglobatus Batsch, Agaricus stercorarius Schumach., Agaricus virosus Sowerby, Coprinus semiglobatus (Batsch) Gray, Stropharia stercoraria (Schumach.) 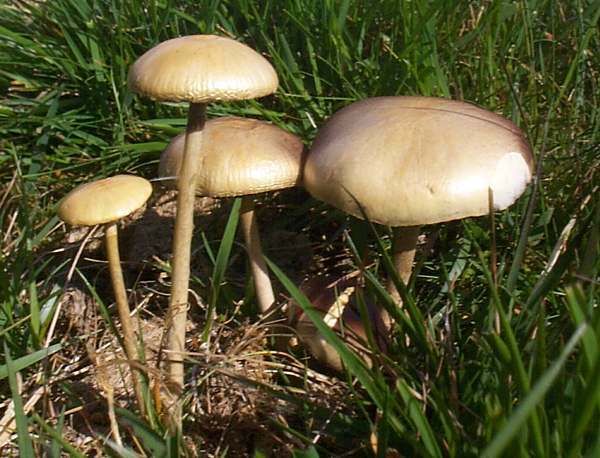 Quél., Stropharia semiglobata var. stercoraria (Schumach.) Bon, Psilocybe semiglobata (Batsch) Noordel., and Stropharia semiglobata (Batsch) Quel. 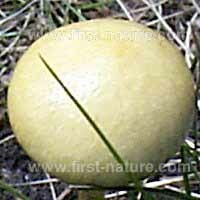 Proto- means first, while stropharia means with a belt - surely a reference to the stem rings of Stropharia species - while the specific epithet semiglobata means just what it sounds like - half a globe (hemispherical in shape, therefore). 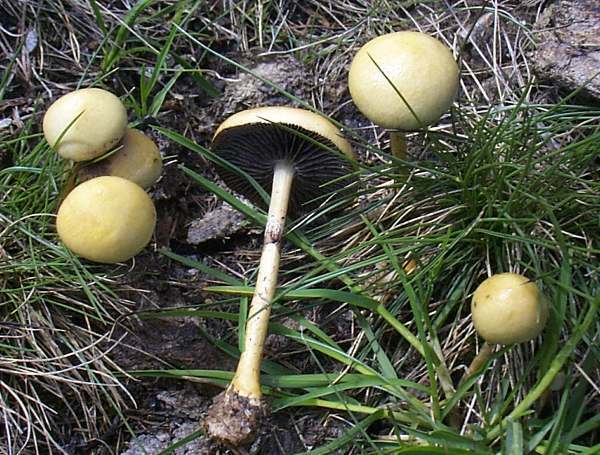 Protostropharia semiglobata is described in some field guides as edible and in others as inedible or suspect. In view of the fact that they grow on dung and that some fungi in this genus are known to be at least moderately poisonous, we recommend that this species should be regarded as a toxic toadstool. The hemispherical cap of the Dung Roundhead is 1 to 3cm in diameter. It is viscid when wet; smooth and shiny when dry. The thin cap flesh is very pale; it is inedible. At first pale clay-brown, the moderately spaced adnate gills of Stropharia semiglobata darken to cinnamon with pale edges as the spores mature. 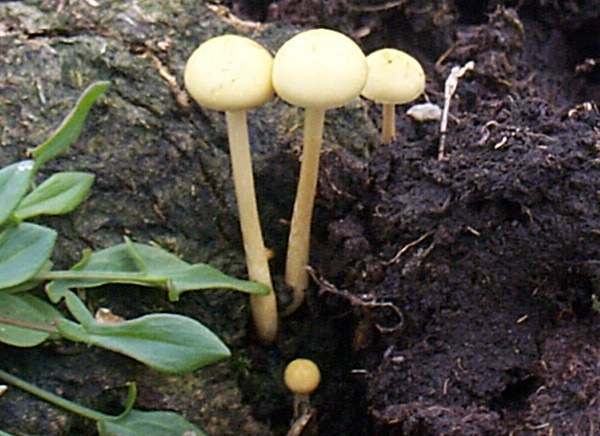 Concolorous with the cap, 2 to 3mm in diameter and 5 to 10cm tall, the smooth, slender stem of the Dung Roundhead is very pale at the apex and pale ochre below the transient ring; its flesh is solid and pale ochre. The ring zone is white at first but discolours purple-brown as the fruitbody ages and spores are released from the gills. 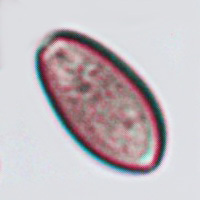 Ellipsoidal to ovoid, smooth, 15-19 x 9-11μm; thick-walled; with a small apical germ pore - most clearly visible in the spores at top left and bottom left as a thin region in the outer wall at the sharper (apex) end of the ovoid spore. 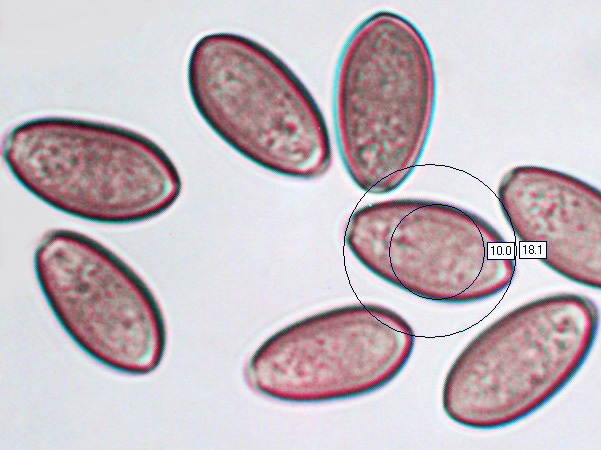 Protostropharia semiglobata is saprobic on animal dung and freshly manured grassland. 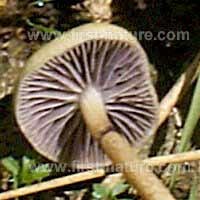 Panaeolus semiovatus also occurs on dung; it retains its stem ring and provides a black spore print. Protostropharia semiglobata (Batsch) Redhead, Moncalvo & Vilgalys. Index Fungorum 2013. Smith KN. (2005). A Field Guide to the Fungi of Australia. Sydney, Australia: UNSW Press. p. 181. ISBN 0-86840-742-9.